Sound is a great part of a project to add production value because it adds so much towards the audience’s perception of “quality” but does so in ways that the audience doesn’t consciously notice. In contrast, sound problems are among the easiest issues for the general population to identify. When Andrew McMunnigall, Senior Policy Officer at the NSW Government’s Department of Trade & Investment came to us recently with a request to add production value to an existing video, we knew immediately that sound would play a big part in that process. The original video was produced by the Department’s internal communications team and was built around interviews they had shot. Our main direction from the client was that they were keen to use the existing selections from the interviews. Beyond this we were given a lot of freedom with how to enhance the message. With a new script to shift the emphasis of the video from basically “great lifestyle and work opportunities as well” to “great work opportunities and a lifestyle to match” we had to re record a new V/O. To make sure that the voice over would really cut through with clarity in any viewing environment we wanted to be able to push both the EQ and compression. Because of this, we chose to record using a Rode NT1A mic which has an extremely low internal noise level. This translates into being able to push the compressor and the top end of the EQ a very long way without having any limitations from microphone noise. For the same reasons we ran the NT1A into an R16 multitrack recorder. The R16 has a fully integrated mixer with it’s own internal mic preamps and, perhaps most importantly, 24 bit resolution for the recordings and all of this helps maintain the very clean signal from the NT1A in it’s pristine state. This recording chain avoided many things that can add beautiful character to a recording such as tube preamps etc. but because the first priority was clarity it made more sense to add a bit of colour and warmth to the whole mix at the end of the process- but more on that later. 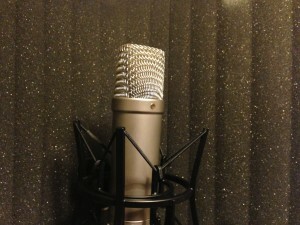 We’ve been using Rode mic’s for years and have several. Rode design and build their microphones in Sydney and we were very pleased to hear that they were recently named Australian Manufacturing Exporter of The Year. As is our standard practice, we took an XML out of FCP and built the mix in the box with Logic Pro 9. In Logic it was easy to go in and edit out each breath and tweak any edits, usually with very short fades (less than a second) at the start and finish of each phrase. This was important because those breaths and edits would be grabbed by the compressor and become far more audible than they seemed. We chose a ClassA-R compressor to start the process of adding some warmth while maintaining clarity. The comp settings we ended up with were aggressive to say the least, a threshold of -38.5dB, zero milliseconds Attack Time and a Ratio of 10:1. Even so there was no noise creeping into the sound. On Logic’s Channel EQ we boosted 3400 Hz by 12 dB and 13 kHz by 8.5 dB while pulling back 500 Hz by 4.5 dB and 80 Hz down 9.5 dB. This lightness on the bottom end was both for clarity and separation from the music’s strong bass frequencies. On the Channel EQ in Logic it defaults to having the Q factor linked to Gain, so that the further you push a band the narrower the frequency range becomes. For film & tv style mixing switching this off makes the EQ behave much more like what we expect, with large gentle ranges of frequencies controlled by each band. It’s important to switch this feature off before making any tweaks because if you switch it off later, any EQ’ing you’ve already done will still retain their narrow bands. As you would expect we put the EQ after the Compressor on the channel strip allowing it to function on top of the work the comp was already doing and preventing the compressor “biting” at the boosted frequencies. The interview audio also travelled across from the edit with the XML, which is great because it references the original files making it easy to do tweaks to the in and out points that are well under one frame. These sub-frame edits are really useful for getting the cleanest possible sound and again we added very short fades to the beginning & end of each phrase for more smoothness. The interviews were shot on a DSLR and the audio was recorded from a lapel mic to an external recorder so the sound quality was solid. The audio was synced to the vision and exported as ProRes 422 before it was delivered to us, so the workflow was also very easy. The nature of interviews demands a more natural sound than voice over in order to fit with the image of the actual person so we used a lot less compression and set this for each different interview subject. The Threshold ranged from around -12 to -18 dB and the Ratio from 1.5:1 to 6:1. On the EQ front it was similar choices to the V/O but to a lesser extent with the frequency Gain up or down and tailored to the character of each subject’s voice. The volume automation from Final Cut travelled across in the XML and became our starting point for the music mix in Logic. Riding the level of the music throughout to fine tune the balance around the voices and the changes in the music itself gave us a complete pass of Music & Voice mix. This voice & music mix would often become the final mix but there is so much more potential to add to a project with sound effect and ambience. This is a fine line. FX & Atmos adds a lot of subconscious value to a mix but have to be handled very carefully so that they don’t overpower or conflict with the crucial voice & music elements. The most important element in making this high-wire act work is the EQ. As we’ve been building more and more layers of FX & Atmos into our mixes, we’ve been needing to develop a more efficient way of handling the EQ of all of those elements in order to meet the tight deadlines that are a constant reality. One day, DAW software will allow you to also add plugins directly to a clip, the way that video editing apps do. At the moment they are still seem to be tied to something that mirrors the physicality of a hardware based studio which is all about the sound flowing through the system and getting affected on it’s way. So we’re working with a system that is allowing us to add unique EQ to a large number of very different sounds quickly and efficiently and at the same time create an environment where the final mix is happening from a manageable number of tracks. All of the Atmos & FX elements arrive either with the XML or directly into Logic onto PreMix tracks with the automation turned off. This allows us to tweak the EQ in realtime while the clip is playing to quickly find the right sound and then we use the Bounce Regions function to “record” this down to one of our actual FX or BG tracks. At the same time we could also set an approximate level for that sound. One other advantage of this is that once the settings are right the act of bouncing the clip instantly applies that EQ to the whole clip. If we were writing automation, we would have to find the settings and then go back and write them to that section of the track. Compared to having each element on it’s own track this also makes for a much more manageable final mix and therefore a faster road to the end result. If we need to ride the EQ, that can easily be done with automation on the FX & BG tracks in the final mix but the vast majority of the sounds are sitting neatly into the space as we begin the final mix phase. We ended up with 361 elements in the mix for this project and yet we came down to a very workable 6 tracks of Atmos and 8 tracks of FX to go with the voice & music tracks. The clips on the PreMix tracks were all set to Mute during the bounce and then those tracks were hidden before the final mix. The beauty of this is that even though they were out of sight, on those odd occasions when we needed to re-do the EQ rather than tweak on top of what we’d already done, it was still easily to access the original file and re-bounce as required. While this may seem slower than simply adjusting an EQ automation pass, the amount of time we saved on this project well and truly balanced out those few occasions when it was necessary to go back and re-do the EQ pre-mix. The final mix then began with all of the elements in place, mostly with their final EQ and compression and their base volume level set. So the mixing stage becomes what it really should be… a subtle, moment by moment balancing of all of the elements in a fast and intuitive process. For the final mix I like to start with all of the mixer channels set to quite a low baseline, usually -12 dB, because this gives a much better balance between room to pull back and room to momentarily push channels up on the control surface. The beauty of mixing digitally in the box is that there’s no quality or noise penalty for working this way. The concept of Mastering sound as a separate process to the mixing is a little alien to the film & tv world but very much standard practice in the music world. The thing that’s brought it into our workflow is a very beautiful bit of software called Mixbus. While Mixbus is a full Digital Audio Workstation itself there are still a few limitations stopping us from using it for full mixing, most notably the limited control surface support and tricky handling of video playback. 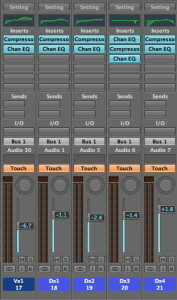 However Mixbus does have one feature that is irresistible and that’s the sound. Mixbus is a product of Harrison Consoles who make some of the biggest and best mixing desks in the world including the 384 channel mixer in the Alfred Hitchcock Theatre at Universal Studios. These desks are in fact Consoles rather than Control Surfaces in that the audio travels through the system rather than the desk simply sending control messages to the DAW. Because of this they actually affect the quality of the sound passing through them, in the case of Harrison desks very positively. When Harrison started producing fully digital consoles their engineers had to work out how to replicate the aspects of the signature sound of their analogue consoles in the digital world. The exact way that they did this is one of the great secrets of the audio world because it worked so successfully. So when Harrison put the same processing knowledge into software form as Mixbus it was very exciting. The good news is that while it still has the limitations I’ve mentioned, the sound is there and it’s quite simply wonderful. We’ve tested a lot of different plugins, including some really nice vintage compressors & EQ’s but there is something quite unique about the big, warm Harrison sound and it’s amazing to have it on your desktop. So our current workflow is to finish our mixes in Logic as if that was the final version. We’ve found that if the mix is spot on then it sounds better after passing through Mixbus but flaws in the mix are often more noticeable because of the extra clarity in the Harrison master channel compressor. We Bounce the finished mix to a 24 bit Wave and then bring it into Mixbus. I’ve done some tests with taking the submixes into Mixbus and letting it do the summing and while there is a payoff with this when we have time, just taking the full mix in has such a dramatic effect of the quality we’re generally doing that at the moment. In Mixbus there is a dynamics processor and EQ on every channel strip and then a few extra controls on the Master Channel. These closely mirror the controls on the big Harrison consoles both in look and function. I like the philosophy of having the EQ and dynamics built into every track because they are such fundamental tools for shaping sound that you really need to have them available on every element of a mix. For our current purposes though, we’re simply relying on the Master Channel to add a little bit of overall compression and the tiniest bit of boost to the mids or top end on the EQ. What we’re getting though is mainly the flavour of the virtual console. I’m always a little skeptical about how much these ideas can actually improve a sound or picture. It’s like making digital footage look like film. It’s very easy to make digital footage look like bad film, just add tons of dust and scratches, crush the shadows and turn the saturation up too much. Make it look like really good film? Very complex. So when we started testing Mixbus I took a mix we were already very happy with through the process and put both the Logic only and the Logic+Mixbus versions on the timeline in FCP and switched between them. The result was chalk and cheese. The version that had been through Mixbus sounded bigger, clearer and warmer. Because the process is so effective, I keep second guessing it and have repeated this experiment now with several different mixes, including this one and have come up with the same conclusion each time. There is also a rumour that Harrison are working on a dedicated control surface for Mixbus. Given their history with the hardware side of things this could be a real game changer and turn one of the little weaknesses of Mixbus into one of it’s biggest strengths. Sound is such a powerful tool for affecting the audience. It can convey a sense of quality, give the audience the feeling of a world that extends beyond the borders of the screen and provide a shortcut to trigger a wide variety of emotional responses and all in ways that the audience rarely thinks about directly. In short, the soundtrack is very fertile ground for adding production value to any project.